Quanser is proud to announce that its Founder and Chief Technology Officer, Dr. Jacob Apkarian, was awarded an honorary Doctor of Engineering degree by the University of Waterloo, of Waterloo, Ontario, Canada. The award was conferred on June 15th during the university’s engineering convocation ceremony. 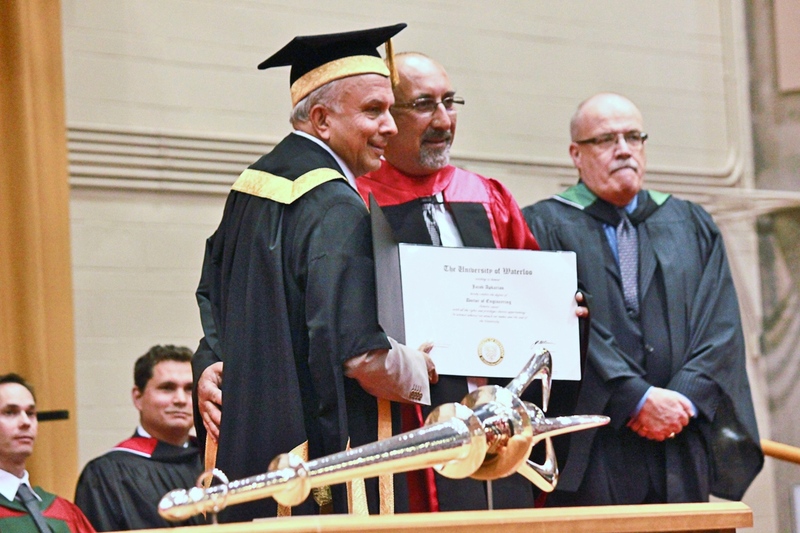 In recognition of his achievements in the entrepreneurial and academic worlds, Quanser Founder and Chief Technology Officer Jacob Apkarian was awarded an honorary Doctor of Engineering degree by the University of Waterloo on June, 15th, 2013. The university described Dr. Apkarian’s achievements in this way: “Dr. Apkarian is an engineer, entrepreneur and a valued colleague of the University of Waterloo. He is an authority in the area of control systems and related fields such as mechatronics, haptics and robotics. Dr. Apkarian's work contributed to the success of the Canadarm I and II. A number of Jacob's Quanser colleagues attended the ceremonies and, below, offer a personal appreciation. Jacob has what can only be described as an "overly inquisitive" mind, and his imagination knows no bounds. As a young engineer he made major contributions to many sophisticated projects, including the legendary Canada Space Arm, where he successfully applied his innovative approach and intuitive understanding of Robotics and Control Engineering to develop complex algorithms that are more than likely still in use today. In 1989 he decided to turn his attention to the academic engineering community and provide interesting and motivating platforms for the next generation of engineers to learn how to put theory into practice. For over twenty years Quanser (derived from QUestion & ANSwER) has continued to develop and advance this dream and continually break new ground. As his friend for almost twenty years, and business partner for twelve, I can say from the heart that this honour is well deserved and his legacy is that we are still operating ahead of the curve thanks to his mentoring and guidance for so many years. Quanser is a very open and dynamic organization where the qualities of your ideas and the conviction in your actions matter more than the number of degrees you have, or the thickness of your resumé. But this award was a moment where everybody paused and reflected on a singular member of the team who has achieved what most of us only dream of. The accolades expressed about Jacob were many, significant, and genuine. And characteristically, Jacob accepted the honours with profound gratitude and humility. In addressing the graduates at the convocation ceremony, Jacob made the observation that "intuition develops as 'tuition', in the sense of instruction, is applied." Jacob embodies this principle. His wealth of knowledge and experience is evident in every conversation, along with the uncanny intuition that stems from it. Combined with his passion for engineering education and a healthy dose of humility and wisdom, Jacob possesses those unique qualities that have made him the successful entrepreneur that he is. But Jacob is more than an entrepreneur; he is a mentor, an inspiration and a friend and he continues to touch the lives of many. The honour was well deserved. Congrats to all of you, those who get awards. keep it up.